Omega-3 is the classification of some kinds of fat acids which result from disintegration of food fats in an organism. They are used for formation of the membranes surrounding every cells. Fish receive omega-3 oils from plankton they eat. Names of these omega-3 oils are EPA (eicosapentaenoic acid) and DHA (docosahexaenoic acid). 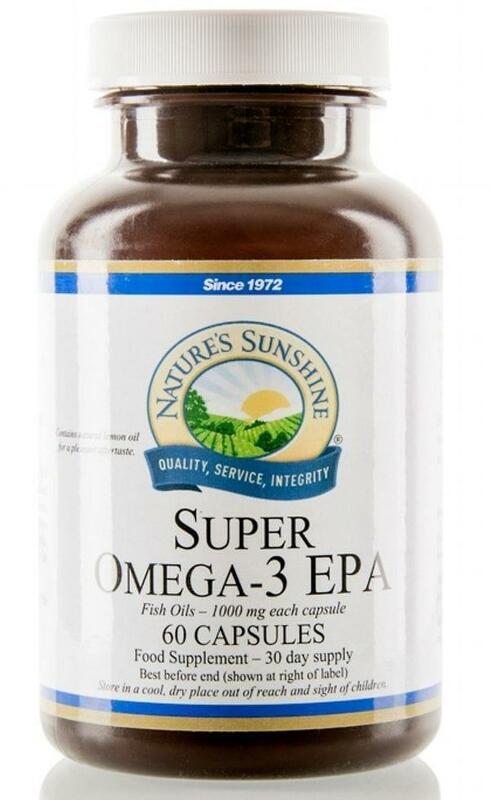 Nature's Sunshine's Super Omega-3 EPA is more competitive and powerful product in comparison with others in the market. With addition of lemon oil to minimize any fish smack. Omega-3 has numerous advantages to health among the majority of systems created for our organism and have been well studied by specialists. Omega-3 products are known as as Essential Fatty Acids (EFAs) as they are useful for good health. Omega-3 fat acids are one of forms polyunsaturated fats, which our organism demands to be healthy. Years of clinical researches assure that a diet rich in omega-3 Fatty Acids is necessary for healthy immune and cardiovascular systems. As your organism can’t make out the EFA’s, your Essential Fatty Acid requirement should be executed through your diet or by means of additives. These main nutritious elements may be found in flax seeds, sea fish and green leafy vegetables, but a lot of people do not eat enough of these products to satisfy requirements of an organism. EFA’s are now one of the most studied products of public health services and science has shown the wide range of advantages to health. Omega-3 Fat acids are the main components of nervous cell membranes. They help nervous cells to communicate with each other, that is an important step to maintenance of good mental health. Specialists have found out, that without enough fat acids, the organism may use the sated fats for construction of cell membranes. As a result will be older looking, less elastic skin, which occupies more time to cure and aspires to show, wrinkles faster. Nature’s Sunshine’s Quality Assurance specialists always check up all raw materials which are necessary for creation of the additions so you can be assured, that you receive the cleanest source of Omega-3 available.